It has always been understood that waiting is an in-between time; but what if waiting is the very thing that has been shaping us throughout history? This talk focuses on how our communication media shift our experiences of time and waiting; these shifts have shaped not only how we understand human intimacy and connection, but also how we learn and build knowledge about our world and the universe. 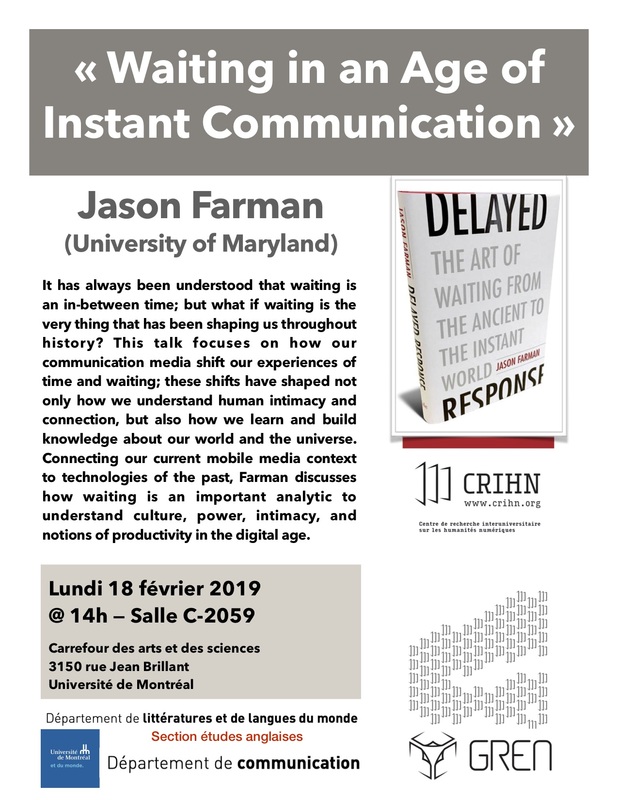 Connecting our current mobile media context to technologies of the past, Farman discusses how waiting is an important analytic to understand culture, power, intimacy, and notions of productivity in the digital age. En association avec le GREN, cette conférence est présentée en collaboration avec le département de communication et des littératures et langues du monde de l’Université de Montréal. Ce contenu a été mis à jour le 17 février 2019 à 16 h 36 min.